What is Vietnam visa on arrival (Vietnam VOA)? Visa on arrival is one of two ways to obtain a visa for Vietnam in addition to the traditional way of getting a visa at Vietnam Embassy. With Visa on arrival, the visa applicant is required to submit an online application for a visa approval letter which functions as an official permission allowing you to board the flight and have visa stamped at the arrival airport in Vietnam. 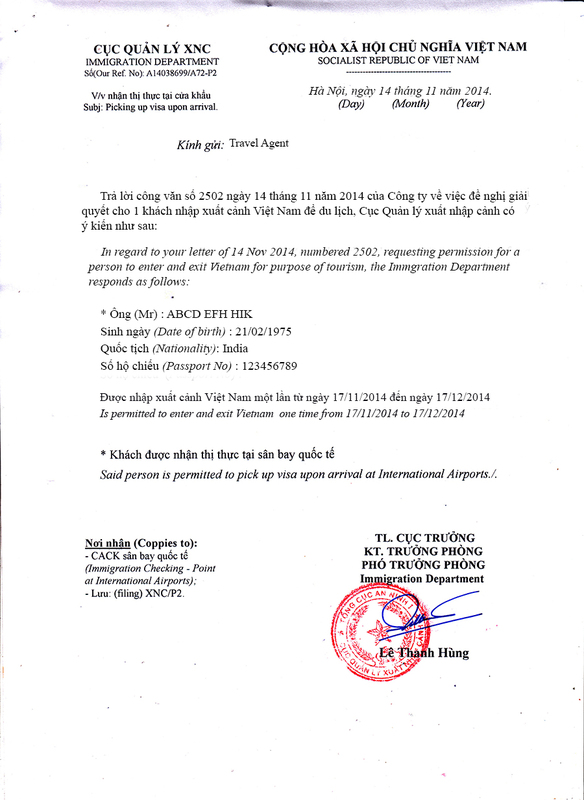 This letter is approved and published by Vietnam Immigration Department in Vietnam. To get visa stamped, you need to submit your Vietnam approval letter together with your passport (at least 6 months validity), one passport-sized photo, entry and exit form and stamping fee to Immigration Officers at the airport. There is a basic difference between visa on arrival and visa at Vietnam embassies. With visa on arrival, the Vietnam Immigration Department will issue a visa approval letter with your name on it stating that you are allowed to enter Vietnam on a specified date. Then, you will have the visa stamped onto your passport at the arrival airport in Vietnam. But for visa applied at the Vietnam embassies, the visa stamp has been on your passport already when they send it back to you. What is the Vietnam Visa approval letter? 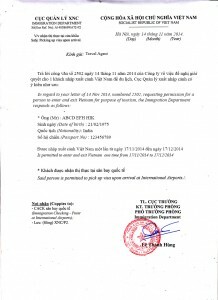 “Vietnam Visa approval letter” is a document issued by Vietnam Immigration Department (Vietnam Ministry of Public Security). It functions as an official permission allowing its owner(s) to board the flight to Vietnam and get visa stamped onto the passport upon arrival at Vietnam airport. To get this approval letter, you – the visa applicant is required to submit an application online to a travel agency. All your information will be sent to Vietnam Immigration Department for checking and then the Visa approval letter will be published. You have this letter, it means you are allowed to enter Vietnam for a specific time and your Vietnam Visa will be issued at Vietnam airports. This letter will be sent to you by email. You just need to print it out and use it for boarding and getting the Visa at Vietnam airport. How long does it take to make the Visa approval letter for Indian citizens? Normally, the visa approval letter is processed and delivered to your email within one to three (01 to 03) working days (excluding Saturday, Sunday and National Holidays) after you finished your Vietnam visa application and made payment of service fee to www.vietnamimmigration.in. Vietnam Visa approval letter for Indian citizens can be done within 2 or 4 or 8 hours for rush case. Contact us by email info@vietnamimmigration.in for further information. A colored scan of the visa approval letter will be sent to your email, so please make sure that you have provided us with the correct email address. Normally the scan of Visa Approval letter will be in PDF or JPEG format. Therefore, to read and print it, please make sure your PC / laptop has installed these programs already. Must I provide you with the exact date of arrival? No, it not necessary. The date of arrival you provide should be the earliest date you plan to arrive in Vietnam because you cannot arrive in Vietnam before that date but you can arrive later than that date once it is granted in your visa approval letter. You also do not need to provide the exact date of exit, just provide the last day you plan to stay in Vietnam and you can exit Vietnam before that date. For example, if you apply for 1 month visa and your planned arrival date is Jan 1, 2013, you can provide Feb 1, 2013 as your exit date, and you visa will be valid from Jan 1, 2013 to Feb 1, 2013. You can arrive in Vietnam anytime between Jan 1 – Feb 1 but must leave the country by Feb 1, 2013, unless you get a visa extension. Note: The visa approval letter cannot be amended once it is issued, so in case you wish to arrive earlier than the date stated on the approval letter, you are required to apply for a new letter to update the date of arrival. What if I change my flight ticket and enter Vietnam later than the arrival date granted in my visa approval letter? Please do not worry. If you have already had your visa approval letter granted with the arrival date you submitted to us and your flight is changed to a later date which is within the granted arrival date and exit date, you can still get the visa stamped at the airport with that approval letter. But remember, you are not allowed to enter Vietnam earlier than the arrival date and leave Vietnam later than the exit date granted in your visa approval letter. If you enter Vietnam on an earlier date, you are recommended to apply for a new visa approval letter. But in case you wish to leave Vietnam on a later date, you should apply for a visa extension or apply a new Visa which allow you stay longer in Vietnam. For example: Your approval letter said that you can enter and exit Vietnam one time from 26 Nov, 2014 to 26 Dec, 2014. It means you can enter Vietnam whenever you want within the time from 26 Nov, 2014 to 26 Dec, 2014. But you have to exit Vietnam before 26 Dec, 2014. How long should I apply for a visa in advance? You can apply for a Vietnam visa from 3 working days to 6 months in advance. Although it takes only 1 to 3 working days to get your visa approved (excluding time of submitting your information to the Vietnam Immigration Department for initial checking), you are highly recommended to apply for a visa at least 1 – 2 weeks prior to your arrival date to avoid any unexpected problems. Click here to check the Visa fee for Indian citizens. Can I get a Visa at the airport without the letter when I arrive? Without a valid approval letter, you are not allowed to enter Vietnam unless your nationality is included in the Vietnam visa exemption list. In order get on flight to Vietnam, you must show the approval letter to the airlines for checking-in. This letter is also compulsory in order for you to get the visa at the Vietnam airport. Therefore, we recommend that spend time to make sure you have the visa approval letter in hand before getting to the airport to avoid having to delay or change your flight. Be kindly informed that the visa on arrival works at all 4 (four) international airports of Vietnam: Tan Son Nhat airport – SGN (in Ho Chi Minh or Saigon City), Noi Bai airport – HAN (in Hanoi city), Cam Ranh airport – CXR (in Nha Trang city) and Da Nang airport- DAD(Da Nang city). So there will be no problem against switching between these 4 airports. You are allowed to enter Vietnam later than the granted arrival date, but earlier arrival is not allowed. In case you change your plan and have to arrive in Vietnam before the granted arrival date, you are recommended to apply for a new visa. You must leave Vietnam by the granted date of exit. If you wish to stay longer in Vietnam, you should apply for a visa extension. There is a big difference between a single entry visa and a multiple entries visa which lies on the number of times you can enter and exit Vietnam. The single entry visa allows you to enter and exit Vietnam ONCE only. Your single entry will automatically become invalid once you exit Vietnam no matter your actual exit date is earlier than the granted exit date. In case you want to come back Vietnam, you are required to obtain a new visa. The multiple entries visa allows you to enter and exit Vietnam as many times as you wish. It means that you can exit and then re-enter Vietnam at any time during your visa validity. Your multiple entries visa will become invalid on the granted exit date. Can I apply for a visa on arrival for my land arrival? Visa on arrival is applicable to AIR TRAVEL only since the visa applicants must get visa stamped onto their passports at their arrival airport in Vietnam. In case you travel to Vietnam by land, you should obtain a visa at Vietnam Embassy which is the most convenient for you prior to your departure to Vietnam. For service fee, you will pay to us using your credit card/debit card. For stamping fee, you need to pay in cash (USD) to Immigration officer at Immigration Control Desk.